After days of a rapidly-growing uprising in the Russian capital, Tsar Nicholas II abdicated on this day 100 years ago, bringing an end to the Empire. Follow these fateful events with #1917LIVE, RT’s social media project covering history in real time. In the weeks preceding the fall of the centuries-old Russian monarchy, the air was thick with discontent: it was a cold winter – even by Russian standards – the exhausting WWI was still ongoing, supply trains were failing, prices were going up, and bread rationing had been introduced. Protests in the capital, St. Petersburg – then called Petrograd – broke out on March 8, the first being a demonstration of disgruntled women’s textile factory workers. They were largely spontaneous and locally-organized, with no plans for a revolution beyond daring slogans. — Russian Telegraph (@RT_1917) 8 марта 2017 г. In a matter of days the demonstrations grew loud and massive. Thousands of workers halted major plants and factories and joined the February Revolution – still maintaining that name after the then-used Julian calendar was replaced by the Gregorian. — Russian Telegraph (@RT_1917) 10 марта 2017 г. The uprising started quickly gaining momentum after military units refused to crack down on the demonstrators and switched sides. By March 13, some 127,000 soldiers were in the state of mutiny. Joined by the military and army deserters the protesters clashed with police, looted ammunition depots, police stations and jails, setting prisoners free. — Russian Telegraph (@RT_1917) 12 марта 2017 г. Amid the chaos in the capital, the tsar – who was at the army headquarters in Mogilev (in modern-day Belarus) – ordered the dissolution of the parliament, the State Duma, on March 12. In defiance, MPs appointed the Provisional Committee, led by politician Mikhail Rodzianko. A parallel body was also created, the Petrograd Council of Workers' Deputies, eventually leading to dual power. — Russian Telegraph (@RT_1917) 14 марта 2017 г. More withdrawn and shaken by events, and disappointed by disloyalty, Nicholas II issued a late, futile order to retake Petrograd. — MP Mikhail Rodzianko (@MRodzianko_1917) 13 марта 2017 г. However, even the units guarding the imperial family in Tsarskoye Selo residence – those meant to be the most loyal to the crown – turned against it and sided with the revolution. — Russian Telegraph (@RT_1917) 15 марта 2017 г.
Nicholas II left the army headquarters to reunite with his family in Tsarskoye Selo, but never made it there. On his way there he was forced to abdicate. Nicholas abdicated in favor of his brother, Mikhail, who refused the crown, bringing to an end three centuries of the Romanov dynastic rule. The Russian Empire was no more. The power vacuum meant that it ended up in the hands of those with the narrowest mandate, the middle-class politicians, who assembled the Provisional Government in which 10 of the 11 posts were taken up by center-right politicians. While some of their reforms were overdue and laudable, almost from the start they were competing with a parallel, more radical center of government in the Soviets, the industrial councils. Despite the February Revolution being known as largely bloodless, there was violence. Police and Cossacks fired upon demonstrators and mutinous soldiers fired at authorities. Angry crowds began to hunt down individual gendarmes. The figures on casualties in the February Revolution differ greatly, from several hundred to over 1,000. 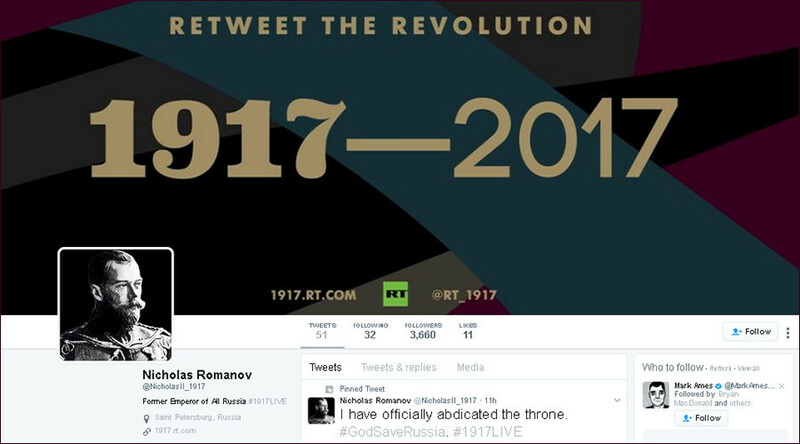 To help our audience engage with the complex and contradictory events of 1917 in Russia, since the start of the year, we have been running #1917Live, a Twitter project that relives the impactful 12 months in real time, a hundred years later. What better way to reflect the diversity of views in the period than through the dozens of competing voices who have been tweeting their views on the Revolution? You also have an opportunity to engage with the Russian Revolution and become part of our project by creating your own historical Twitter account under the #1917CROWD concept.